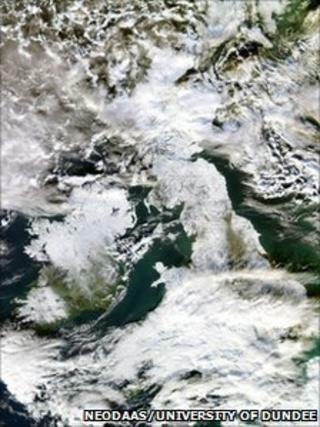 Thousands of air and rail passengers remain stranded across the UK as snow and ice continues to cause chaos. Hundreds of passengers were trapped on six East Coast trains from London to Peterborough as all services were suspended on that section of the route because of powerline damage. There is disruption at London's two main airports - Heathrow and Gatwick - and at smaller airports across the UK. Eurostar is running a restricted service out of London. Heathrow has been criticised for the length of time it took to clear tonnes of snow from runways and plane stands, but the government has revealed that its offer of Army assistance was turned down by airport operator BAA. Transport Secretary Philip Hammond said: "We've said if they need additional manpower, a bit of muscle to clear snow, we can provide them with troops and lorries to do that. "They're telling me at the moment they have all the muscle they need. They've cleared most of the stands here and they're actually now in the process of clearing the south runway to get that opened." Heathrow Airport is operating a reduced flight schedule until at least 0600 GMT on Thursday, although the Department of Transport has relaxed night-flight restrictions at the airport. Normally all flights stop between 2330 and 0600, but for the next three nights arrivals and departures can continue until 0100, with arrivals only after 0100. BAA said Heathrow's south runway would remain closed on Tuesday and advised people not to travel to the airport unless their airline had confirmed the booking. BAA chief executive Colin Matthews has promised a thorough investigation into how Heathrow handled the freezing weather. He told BBC Breakfast: "When we have got every passenger where he or she wants to be, then we will crawl over every aspect of these last few days." He said Heathrow had been hit by snow not seen in his lifetime, which had taken longer than expected to clear from under aircraft and from the stands. Eurostar asked customers booked to travel before Christmas to exchange their tickets for travel at a later date or get a refund free of charge, if their travel was not essential. Speed restrictions on its high-speed lines are adding up to two hours on journey times. East Coast spokesman John Gelson said the decision to suspend services in and out of King's Cross for the whole of Tuesday followed powerline damage at Huntingdon, near Peterborough, which he said was weather related. He said trapped passengers were being "well looked after" but told all passengers at King's Cross station to go home and restart their journeys on Wednesday. Ian Dormer, who was stuck just outside Huntingdon station, told the BBC: "We're going to have to climb down a ladder from the train on to the trackside, where they're going to evacuate us in groups of 20." He said they would then be led to safety down the track to the station. Network Rail said engineers were on site to fix the problem and its immediate focus was to help the affected passengers. Forecasters have predicted there will be no let-up in the freezing conditions until Boxing Day. BBC forecaster John Hammond said while the southernmost counties of England had seen a slight rise in temperatures, it would be very short lived, with no significant thaw this week. More snow is also forecast to be on its way, with Wales, the north of Northern Ireland and northern Scotland likely to see up to 4in (10cm). The Met Office warned temperatures could fall as low as -20C in parts of northern England, southern Scotland and Northern Ireland on Tuesday night. The European Union has heavily criticised European airports for their response to the recent weather, with transport commissioner Siimn Kallas telling them to "get serious" about planning. Gatwick spokesman Andrew McCallum said 600 flights would leave on Tuesday, and measures were in place to cope with any more snow. "We only closed for four-and-a-half hours on Saturday and kept Gatwick open through Sunday and also yesterday, with about 80,000 passengers travelling each day," he said. "We're as prepared as we possibly can be for further snow this week." But the airport warned that passengers should expect further disruption on Tuesday, with delays and cancellations inevitable. Martine Gurbhoo is at Gatwick, having been to due fly to Paphos on 19 December. She told the BBC she and her husband had moved to the ticket hall "as we have been told to get out of the main departure lounge, otherwise we will get escorted by the police". And Damian McCarthy of Harpenden had to return home after spending most of the day at Gatwick with a five-year-old child. He said other passengers were "very angry, with many refusing to leave the terminal building".